SimchaYoga - Tag Archive for "Sapa"
We woke to the roosters in Ban Ho, news blasting from speakers mounted throughout the village, sore muscles and blisters. Counting our blessings that we were not part of a larger group, we wussed out and skipped the third day of trekking. Like the past two days, it was in the 90s. So, instead, we hiked down to the river, soaked our tired feet and practiced our meditation and yoga on the rocks. It was a perfect morning. 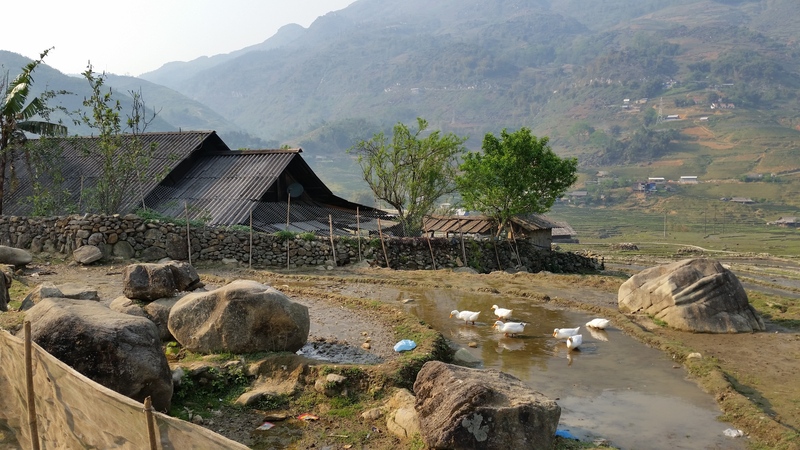 Eventually, we went back for our backpacks, said our goodbyes and took a minivan back to Sapa. The drive was not pretty. The road conditions are miserable. Don’t know how our French friends did it on the backs of motorbikes… Our driver was terrific, avoiding the bikes, people, pigs and oxen, but there was nothing to be done about the ruts and washed out pavement. After an hour, we made it back to Sapa and were treated to lunch by Louis and his girlfriend. She has a one room place in town, and prepared a lovely, three course meal for us. I am continually impressed what one can do with one burner and a rice cooker. Somewhere along the way, I realized we did not have the name and address of our Hanoi hotel. Louis tracked it down, wrote it out, and saved us from a “Lost in Translation” experience. With a few hours left before the bus to Lao Cai and the overnight train to Hanoi, we found a place for an herbal soak and massage. I’m still learning to be very clear on what services are offered for what price and for how long… My masseuse was very good, and though the 90 minutes were up in an hour, I felt restored. …Until the bus ride back to Lao Cai, that was hell. The driver somehow decided to get us down the mountain 10 minutes faster than scheduled. In the process, making us all miserable, and risking our lives. I’ve been on lots of busses on steep windy mountain roads in lots of countries. I was pretty convinced this might have been my last. When we finally got back, I thought the guy next to me was going to punch out the driver. Rachelle almost lost her lunch. I took pictures of the bus number just in case I ever decide to complain. Relieved, we waited for the guy who was to meet us, show us around …., suggest a place for dinner and get us to the train. He never showed, which did not matter, except that we spent the time waiting instead of walking around. Still, we were looking forward to our sweet little cabin on the train. Turns out, we had been downgraded on the return. Disappointed, but making the best of it, we settled in for the night ride back to Hanoi. We spent the night laughing at our predicament and not really sleeping. When we got off the train at 4am, I remembered to bargain for a cab and paid the proper fare back to La Belle Vie Hotel where there was no room available for early check-in! Our problem was that we were set to go on a day tour of the city at 8am, and we had not showered. Our plan was to commandeer the lobby bathroom and wash our hair in the sink. We hung out in the lobby until 6:30AM, then went down for breakfast. We shared a table with two women from Bangkok and shamelessly told them of our predicament, hoping they would let us use their shower. They had already turned in their key so we thanked them and I went back to the desk to see if anything had changed. A minute later, Rachelle came running up with their key. They got it back for us, let us into the room, and saved us. We call them our Thai Angels. Twenty minutes later, we were clean and much, much happier. Our morning hike was up the mountain. Families were working, clearing terraced rice fields. Oxen were taking mud baths. We watched men on motorbikes dragging scores of long bamboo poles. We visited a pre-school where I could finally take pictures of children. On a bridge, over a dry riverbed, Louis explained the purpose of a split-log bench. I’m too tired now to remember the specifics, but when a child is ill, he or she is placed on the bench and the spirits creating the disease are drained down, through the split wood and into the river. I remember the three of us talking about similar customs in other cultures. Lunch was in a town on a main road. We briefly met two more French women. They left, and our French friends from last night showed up. Louis cooked for us and we all had lunch together, then they took off (very apprehensively) as passengers on motorbikes back to Sapa. We resumed our walk, this time down a steep gully. A few times, we had to get out of the way of children herding oxen. One little boy threw his arm around a baby ox as if they were best buddies. The landscape was beautiful, but I was so intent on protecting my knees, it was hard to appreciate the view. Eventually, I asked that we get back on the road. Between my knees and Rachelle’s blister, it was the smart thing to do. Back on the big road, it got really hot. Once we got closer to Ban Ho Village, we could see the hydroelectric project. There were hot springs not too long ago. Now we saw a huge pipe and heard the steady, shrill sound of the water pressure. The mountain above the pipe is sheared like a huge scar. Everyone living nearby was relocated, only the foundations of their houses remain. A few steps on, we found beautiful spacious homes of lacquered wood. We walked through the town, over a suspension bridge to our homestay. The two French women we briefly encountered at lunch are also there. The Homestay family, of Red Dzao origin, have a beautiful vegetable garden, pigs, chickens and a hammock. We found our sleeping spaces upstairs, similar set up to the previous homestay. Then we hung-out until dinner. We talked a bit with our host. He worked in the tourist industry as a driver for over 20 years, a few of them in Germany. The two French women go trekking all over the world. It’s 5am now and I’m in the hammock listening to the town awaken. Roosters, barking dogs and motorbikes competing for my ears. The crickets win hands down. We are near the river and they never stop. Something too large to be anything but a bat just flew by. At 6am, the entire village is treated to government-sponsored news by loudspeakers placed everywhere. Sa Pa, or Sapa, is a frontier town and capital of Sa Pa District in Lào Cai Province in northwest Vietnam. We started with the highest mountain in Vietnam in sight. Our guide Louis called it Fancy Pants, at least that is how I can remember it. I think it is Fan Si Pan. We had our own entourage, and as good as that sounds, it was not…. We had three Hmong woman following us for the first half of the day. They are eager to help you find your footing, ask you where you are from and ultimately get you to buy their handicrafts. I did not mind any of that. What was invasive was their constant chatter. I could not hear much of what Louis was saying, and when our trek could have been a walking meditation, they were one step behind me, loudly chatting away. It took all my resolve not to be rude. Rachelle and I finally complained to Louis. I ended up buying from two of them, and Louis convinced them to let us go on without them. After that experience, I learned to pretend I did not speak any English. The hike was spectacular. It’s spring, which means baby animals. It’s a good thing we have cameras with a delete button, or most of my pics would be ducklings, chicks, puppies, baby oxen, piglets… Of course, the children are beautiful and sweet, but we are among the hill tribes, and most people do not want to be photographed. Sometimes I can be discrete, sometimes I can take a pic with Rachelle in the background. Louis has his favorite route, so earlier this morning,when he asked if we wanted to take the shorter route and end up at a Homestay with wi-fi and massage, or take the more scenic route, he was happy we opted for the extra hour. We made a wise choice. Most of time we were on back roads through and between villages or up and down river beds. People are starting to prepare the terraced rice fields. Sometimes they use an ox-pulled plow, but if the land is too dry, they go at it with a pick-ax. There is only one crop per year in the north, as opposed to 3/year in the south. The winters up here are too cold for cultivating rice. This week is unseasonably hot. It is in the 90s. We’re drinking tons of water. There is plenty of evidence of torrential rains. The ruts in the road are parched dry but deep. Every so often there is one shoe literally stuck in the mud. Like LA, they need more rain. Louis gave us a historical overview of the hill tribes, their names, when they came to the reign, and from where. (Mongolia) He showed us indigo growing, different species of bamboo, plants grown or gathered for human consumption and plants for animal feed. Before lunch, we crossed the river at the bottom of the valley, over a bamboo bridge, and started up the other side. Lunch was in a little place outside the nearby village. With a couple of pans and a two burner stove, we were treated to a feast. We finished with fresh, strong brewed coffee over ice with condensed milk. We stopped often in the afternoon, first at a village where Louis showed us how hemp becomes cloth, then the indigo dye process. I spotted a grinding stone identical to the one Gary and I found years ago. Now it is in our side garden on a stone pedestal. We never understood how it functioned, so it was a treat to see Louis demonstrate it for us. And I have the video! Here, they use it to grind corn for animal feed. We saw many of them today. By late afternoon, we were invited to sit and have tea with friends of Louis. Sitting in front of their shop, they chatted in Vietnamese, and we people watched. Eventually, we made our way to the homestay, a large barn shaped building. We arrived at the Waterfall Homestay just as the sun was going down. There was hot tea waiting, and hot showers. Except for Rachelle, who showered last and ended up with cold water… We washed out some clothes as we packed very light for this three days. There were two young French women who arrived before us. We all got along very well, and with our guides, our Hmong host and his family, we made a sweet, if brief, community. All was not fun and games however, Louis gave us strict instructions to promptly get to the kitchen area to make spring rolls. After brief, precise instruction, we set to work and managed to create culinary masterpieces. Rachelle showed up a few minutes late and to Louis’ consternation, created free form rolls and proceeded to eat one before it was fried. By then we were all ready to eat. A long table was set up for everyone, Trekkers, guides, our host and his family. The rest of the evening turned into a blur of rice wine toasts. I turned in early. Rachelle stayed up talking to the woman who hosted us. They talked about birthing practices and the conditions of medical care. Upstairs, our beds were mattresses set on the floor, each in a mosquito net, in two rows of 6. Breakfast was sweet coffee, and crepes with bananas and the best pineapple. We said our goodbyes to our hosts and our French friends, and set off for different villages. Our flight to Seoul was uneventful. Sometime during the endless flight, the two people separating me from freedom and the bathroom were fast asleep. I did have a moment of clarity when I realized that it is more important for me to be able to walk around and stretch and pee without climbing over people, then to have the coveted window seat and sleep, Rachelle was happily in her window seat on the other side of the plane. We had breakfast around 4am Seoul time, and landed around 6am. The Seoul airport is a wonderous place for food, shopping and relaxing. We found one of the spas and our layover was long enough for a short massage and a Korean meal, the second of many meals today. They fed us again on the flight from Seoul to Hanoi, and as we gained two hours, we’ll call it lunch. When we landed in Hanoi, we got in line to process our visas. Of course, we were in the wrong line, but the signs were identical. Someone kindly corrected us and then it was our turn to help out the next set of tourists who made the same mistake. Maybe the Vietnamese government just wants us make new friends! An hour later, we were through customs, and we settled in for the drive into town. No waiting for luggage, we were proud to be part of that smug “we just do carry-on” elite. The architecture might be unique to Hanoi. I’ll get back to you on that… The houses are at least 3 stories high, very narrow, and Asian, with upturned roofs and painted in striking color combinations. Some stand alone and some hug each other in larger or smaller groupings. As we got closer to the dense city center, the character changed and we saw more French colonial influence. It was around 2pm and people were eating on tiny stools at short tables on the sidewalks. Sometimes there was a restaurant, sometimes someone dishing out food from a sidewalk kitchen setup. It all smelled great and, amazingly, we were hungry again. At our hotel, La Belle Vie, we were greeted by Mrs. Pham Tuyet Nhung, the rep. from Getaway Halong Sapa Company, who helped us organize our trip. We made one last change, she was gracious and patient, and with our documents in hand, we were on our way – – to lunch. She recommended a lovely traditional restaurant, in one of those French Colonial buildings, a few blocks away. It was a perfect culinary intro to Vietnam, familiar food, but Hanoi influenced. Rachelle had a clear view of the kitchen, expect she’ll be cooking for you all soon. Thinking that was a late afternoon dinner, so the food we bought for the overnight train was a late supper, bringing the total meal count today to 5! We had a hotel room for the day, so cleaned up and re-packed for the trekking trip. What to pack for 3 days of walking from village to village in Vietnam, near the Chinese border, when you don’t want to carry much and the weather is unpredictable? It began when we were met at the hotel by a rep. from EcoTours. She arrived on a moped and put us in a taxi with instructions to meet her in front of the train station. Yes, we could have figured all this out on our own, but jet lag had set in and it was pretty nice to have someone walk us to the correct train, car and room. We are on the train now, it is 3am, and I can’t believe I am hungry! We have all 4 berths to ourselves (thank you Elan). Naturally, the moment we put our stuff down, I went off to find the bathroom. First, I played charades with a woman who works on the train. I kept following her, asking for directions to the toilet and she kept shooing me away. Finally, she started making climbing gestures with her hands and funny repetitive noises. By now there were a few others also interested in finding the toilet. a Vietnamese tour guide came to my rescue and advised me that it was only accessible once the train was moving. Still don’t know why. But I do know the charade was a moving train with sound effects! We are arriving soon, the train is comfortable in a noisy, alive machine, kind of way, it’s been a good adventure aboard. Lots of trekkers from all over. Expect to meet them on the bus ride to Sapa. Around 6am and still dark, we got off the train in Lao Cai and met Louis, our guide for the next three days. (Lao Cai is 2 km from the Chinese border.) He turned out to be delightful, smart and very sweet. He also speaks English beautifully. Our minibus ride to Sapa was great. We were in a cloud bank for most of the hour ride. Then as we ascended the mountain, the mist broke and it was a beautifully sunny say. Looking behind us, there were swirls of mist moving in the valley. Missed photo opp… Louis left us at a hotel where we could shower and have breakfast. We skipped the shower (made the evening one later that much better). Breakfast was perfect, great coffee, strong sweet and endless. The spread was international, fromhard boiled eggs to fried rice. We found something that looked liketater-tots, but was really potato balls rolled in unsweetened coconut and baked. Ok, maybe fried, but who cares. We had banana crepes and chicken noodle soup with lime. Stuffed, we got ready for the 6-7 hour trek. Had to buy a few things we forgot. Turns out, it is unnecessary to bring a backback. The city is filled with North Face knock0ffs. My little daypack was not sufficient for our needs, so $15.00 later I had a padded pack with hip and chest straps. Then we set off for the day.